The Apollo program was the third United States human spaceflight program carried out by the National Aeronautics and Space Administration (NASA), which accomplished landing the first humans on the Moon from 1969 to 1972. During the Apollo 11 mission, astronauts Neil Armstrong and Buzz Aldrin landed their lunar module (LM) and walked on the lunar surface, while Michael Collins remained in lunar orbit in the command and service module (CSM), and all three landed safely on Earth on July 24, 1969. Five subsequent Apollo missions also landed astronauts on the Moon, the last in December 1972. In these six spaceflights, twelve men walked on the Moon. Apollo ran from 1961 to 1972, with the first manned flight in 1968. It achieved its goal of manned lunar landing, despite the major setback of a 1967 Apollo 1 cabin fire that killed the entire crew during a prelaunch test. After the first landing, sufficient flight hardware remained for nine follow-up landings with a plan for extended lunar geological and astrophysical exploration. Budget cuts forced the cancellation of three of these. Five of the remaining six missions achieved successful landings, but the Apollo 13 landing was prevented by an oxygen tank explosion in transit to the Moon, which damaged the CSM's propulsion and life support. The crew returned to Earth safely by using the Lunar Module as a "lifeboat" for these functions. Apollo used Saturn family rockets as launch vehicles, which were also used for an Apollo Applications Program, which consisted of Skylab, a space station that supported three manned missions from 1973 through 1974, and the Apollo–Soyuz Test Project, a joint Earth orbit mission with the Soviet Union in 1975. Apollo set several major human spaceflight milestones. It stands alone in sending manned missions beyond low Earth orbit. Apollo 8 was the first manned spacecraft to orbit another celestial body, while the final Apollo 17 mission marked the sixth Moon landing and the ninth manned mission beyond low Earth orbit. The program returned 842 pounds (382 kg) of lunar rocks and soil to Earth, greatly contributing to the understanding of the Moon's composition and geological history. The program laid the foundation for NASA's subsequent human spaceflight capability. Apollo also spurred advances in many areas of technology incidental to rocketry and manned spaceflight, including avionics, telecommunications, and computers. The Apollo program used four types of launch vehicles. 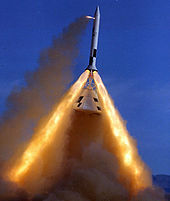 The first was the Little Joe II, which was used for unmanned suborbital launch escape system development. The second is the Saturn I, which was used for unmanned suborbital and orbital hardware development. The third is the Saturn IB which was used for preparatory unmanned missions and Apollo 7. Last, the Saturn V which was used for unmanned and manned earth orbit and lunar missions. The Marshall Space Flight Center, which designed the Saturn rockets, referred to the flights as Saturn-Apollo (SA), while Kennedy Space Center referred to the flights as Apollo-Saturn (AS). This is why the unmanned Saturn I flights are referred to as SA and the unmanned Saturn IB are referred to as AS. From 1961 to 1968, the Saturn launch vehicles and components of the Apollo spacecraft were tested in unmanned flights. There was some incongruity in the numbering and naming of the first three unmanned Apollo-Saturn (AS), or Apollo flights. This is due to AS-204 being renamed to Apollo 1 posthumously. This manned flight was to have followed the first three unmanned flights. After the fire which killed the AS-204 crew on the pad during a test and training exercise, unmanned Apollo flights resumed to test the Saturn V launch vehicle and the Lunar Module; these were designated Apollo 4, 5 and 6. The first manned Apollo mission was thus Apollo 7. Simple "Apollo" numbers were never assigned to the first three unmanned flights, although renaming AS-201, AS-202, and AS-203 as Apollo 1-A, Apollo 2 and Apollo 3, had been briefly considered. From August 1963 to January 1966 a number of tests were conducted for development of the launch escape system (LES). These included simulated pad aborts, which might occur while the Apollo-Saturn space vehicle was still on the launch pad, and flights on the Little Joe II rocket to simulate Mode I aborts which might occur while the vehicle was in the air. Flight time of 94 hours. The Block I CSM spacecraft did not have capability to fly with the LM, and the three crew positions were designated Command Pilot, Senior Pilot, and Pilot, based on U.S. Air Force pilot ratings. The Block II spacecraft was designed to fly with the Lunar Module, so the corresponding crew positions were designated Commander, Command Module Pilot, and Lunar Module Pilot regardless of whether a Lunar Module was present or not on any mission. A total of fifteen Saturn V vehicles were ordered (through AS-515), which would have been enough for three more Moon landing missions through Apollo 20. This flight was cancelled around the time of the Apollo 11 first landing mission to make the launch vehicle available for the Skylab space station. Shortly thereafter, Apollo 18 and 19 were cancelled in response to Congressional cuts in NASA's budget. Several of the missions involved extravehicular activity (EVA), spacewalks or moonwalks outside of the spacecraft. These were of three types: testing the lunar EVA suit in Earth orbit (Apollo 9), exploring the lunar surface, and retrieving film canisters from the Scientific Instrument Module stored in the Service Module. Several planned missions of the Apollo program of the 1960s and 1970s were canceled for a variety of reasons, including changes in technical direction, the Apollo 1 fire, hardware delays, and budget limitations. There were several missions that used Apollo hardware after the cancellation of Apollo 18, Apollo 19, and Apollo 20. ^ a b c d e f g h i j k l m n o p q r s t u v w x y z aa ab ac ad ae af ag ah ai aj ak Apollo Program Summary Report (PDF) (Report). National Aeronautics and Space Administration. April 1975. JSC-09423. Retrieved 29 September 2017. ^ a b "Apollo 11 (AS-506)". Smithsonian National Air and Space Museum. Archived from the original on 4 July 2017. Retrieved 21 September 2017. ^ a b Riley, Christopher (15 December 2012). "Apollo 40 years on: how the moon missions changed the world for ever". The Guardian. Retrieved 1 January 2019. ^ a b c d e Teitel, Amy (28 October 2018). "What Happened to Apollos 2 and 3?". Popular Science. Retrieved 3 March 2018. ^ a b c d Williams, David (11 December 2003). 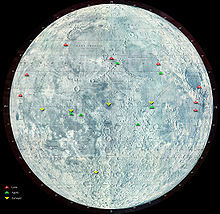 "Apollo 18 through 20 - The Cancelled Missions". National Aeronautics and Space Administration. Retrieved 3 March 2018. ^ a b Apollo 13 Mission Report (PDF) (Report). National Aeronautics and Space Administration. September 1970. MSC-02680. Retrieved 29 September 2017. ^ a b Silber, Kennith (16 July 2009). "Down to Earth: The Apollo Moon Missions That Never Were". Scientific American. Retrieved 1 January 2019. ^ "Lunar Rocks and Soils from Apollo Missions". National Aeronautics and Space Administration. 1 September 2016. Retrieved 30 January 2019. ^ Gaudin, Sharon (20 July 2009). "NASA's Apollo technology has changed history". Computerworld. Retrieved 1 January 2019. ^ Bongat, Orlando (16 September 2011). "Little Joe II". National Aeronautics and Space Administration. Retrieved 30 January 2019. ^ "Rocket, Launch Vehicle, Test, Saturn I, Block 1". Smithsonian National Air and Space Museum. 2016-03-13. Retrieved 30 January 2019. ^ Portree, David S. F. (16 September 2013). "A Forgotten Rocket: The Saturn IB". Wired. Wired (magazine). Retrieved 30 January 2019. ^ Bongat, Orlando. "Saturn V". National Aeronautics and Space Administration. ^ a b c d e f g h i j k l m n o p q r s t u v w x Apollo 17 Mission Report (PDF) (Report). National Aeronautics and Space Administration. March 1973. JSC-07904. Retrieved 21 September 2017. ^ a b c d "Lta8". ^ a b c d "Lunar Module LTA-8". ^ Shayler, David (26 August 2002). Apollo: The Lost and Forgotten Missions. Springer Science & Business Media. p. 117, 124–125. ISBN 9781852335755. ^ Evans, Ben (17 December 2017). "Walking in the Void: 45 Years Since the Last Deep-Space EVA". AmericaSpace. Retrieved 30 January 2019. ^ "Apollo 1". National Aeronautics and Space Administration. 14 June 2012. Retrieved 15 February 2017. ^ "Apollo 1 (AS-204)". Smithsonian National Air and Space Museum. Archived from the original on 4 July 2017. Retrieved 21 September 2017. ^ Garber, Steve (10 September 2015). "Apollo-1 (AS-204)". National Aeronautics and Space Administration. Retrieved 29 September 2017. ^ Ryba, Jeanne (8 July 2009). "Apollo 7". National Aeronautics and Space Administration. Retrieved 15 February 2017. ^ "Apollo 7 (AS-205)". Smithsonian National Air and Space Museum. Archived from the original on 4 July 2017. Retrieved 21 September 2017. ^ Apollo 8 Mission Report (PDF) (Report). National Aeronautics and Space Administration. February 1969. MSC-PA-R-69-1. Retrieved 29 September 2017. ^ Ryba, Jeanne (8 July 2009). "Apollo 8". National Aeronautics and Space Administration. Retrieved 12 September 2017. ^ "Apollo 8 (AS-503)". Smithsonian National Air and Space Museum. Archived from the original on 4 July 2017. Retrieved 21 September 2017. ^ "Apollo 9". National Aeronautics and Space Administration. 8 July 2009. Retrieved 12 September 2017. ^ "Apollo 9 (AS-504)". Smithsonian National Air and Space Museum. Archived from the original on 4 July 2017. Retrieved 21 September 2017. ^ Apollo 9 Mission Report (PDF) (Report). National Aeronautics and Space Administration. May 1969. MSC-PA-R-69-2. Retrieved 29 September 2017. ^ "Apollo 10". National Aeronautics and Space Administration. 8 July 2009. Retrieved 12 September 2017. ^ "Apollo 10 (AS-505)". Smithsonian National Air and Space Museum. Archived from the original on 4 July 2017. Retrieved 21 September 2017. ^ Apollo 10 Mission Report (PDF) (Report). National Aeronautics and Space Administration. August 1969. MSC-00126. Retrieved 29 September 2017. ^ Apollo 11 Mission Report (PDF) (Report). National Aeronautics and Space Administration. November 1969. MSC-00171. Retrieved 29 September 2017. ^ "Apollo 12 (AS-507)". Smithsonian National Air and Space Museum. Archived from the original on 4 July 2017. Retrieved 21 September 2017. ^ Apollo 12 Mission Report (PDF) (Report). National Aeronautics and Space Administration. March 1970. MSC-01855. Retrieved 29 September 2017. ^ "Apollo 13 (AS-508)". Smithsonian National Air and Space Museum. Archived from the original on 4 July 2017. Retrieved 21 September 2017. ^ "Apollo 14 (AS-509)". Smithsonian National Air and Space Museum. Archived from the original on 4 July 2017. Retrieved 21 September 2017. ^ Apollo 14 Mission Report (PDF) (Report). National Aeronautics and Space Administration. May 1971. MSC-04112. Retrieved 29 September 2017. ^ "Apollo 15 (AS-510)". Smithsonian National Air and Space Museum. Archived from the original on 4 July 2017. Retrieved 21 September 2017. ^ Apollo 15 Mission Report (PDF) (Report). National Aeronautics and Space Administration. December 1971. MSC-05161. Retrieved 29 September 2017. ^ "Apollo 16 (AS-511)". Smithsonian National Air and Space Museum. Archived from the original on 4 July 2017. Retrieved 21 September 2017. ^ Apollo 16 Mission Report (PDF) (Report). National Aeronautics and Space Administration. December 1971. MSC-07230. Retrieved 29 September 2017. ^ "Apollo 17 (AS-512)". Smithsonian National Air and Space Museum. Archived from the original on 4 July 2017. Retrieved 21 September 2017. ^ Wade, Mark. "APOLLO 7: AS-205". astronautix. Retrieved 3 March 2018. ^ a b c Rousseau, Steve (2 September 2011). "Why Apollo Really Stopped at 17". Popular Mechanics. Retrieved 3 March 2018. ^ "Apollo 20". Astronautix. Retrieved March 15, 2018. ^ "The Skylab Program". NASA History Office. October 22, 2004. Retrieved March 15, 2018. ^ a b c Due to a management error, the Skylab mission patches were incorrectly designed using an inconsistent mission numbering scheme. "Skylab Numbering Fiasco". WilliamPogue.com. Hallion, Richard P.; Crouch, Tom D. (1979). Apollo: Ten Years Since Tranquility Base. Apollo: Ten Years Since Tranquillity Base. Smithsonian Institution. Bibcode:1979atys.book.....H. ISBN 978-0874745054. Space.com List of Apollo Missions. This page was last edited on 11 April 2019, at 01:38 (UTC).